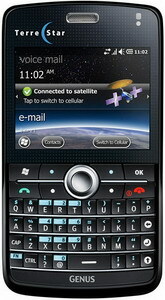 AT&T has finally launched the TerreStar Genus Dual-Mode Cellular/Satellite smartphone. AT&T’s new Satellite Augmented Mobile Service with the TerreStar GENUS dual-mode cellular/satellite smartphone is now available for enterprise, government and small business customers. Intended to be used primarily as an everyday mobile device, the TerreStar GENUS smartphone is an innovative dual-mode device with cellular wireless capability as the primary default mode and satellite access capability as a secondary option for voice, data and messaging. The access to the TerreStar satellite network enables wireless communications coverage in remote areas for government, energy, utility, transportation and maritime users, as well as backup satellite communications capabilities for public safety agencies, first responders and disaster recovery groups. With just one phone number and one smartphone device, users with a line of sight to the satellite will have access to expanded voice and data roaming coverage in the United States, Puerto Rico, U.S. Virgin Islands and in territorial waters. The TerreStar GENUS runs on the Windows Mobile 6.5 operating system to provide rich features and functionality, including a touch screen, Wi-Fi, Bluetooth, camera and GPS. The AT&T Satellite Augmented Mobile Service and the TerreStar GENUS is available today to enterprise, government and small business Corporate Responsibility Users. The service requires standard AT&T cellular voice and smartphone data rate plans, as well as a monthly satellite subscription feature. Usage of the satellite network for voice, data and messaging is not included in the monthly feature charge and is billed as per-minute, per-message or per-megabyte roaming charges on a customer’s AT&T Mobility service invoice. Enterprise, government and small business users should contact their AT&T sales representative for information on availability and ordering. 0 comments on "TerreStar Genus Dual-Mode Cellular/Satellite smartphone launched by AT&T"